Over the years I've struggled to find the right anti-perspirant for me. It got to the point where I had to choose from an under performing anti-perspirant or put up with those dreaded white marks. Up until Sure came out with their Maximum Protection, nothing quite came close to how good it was. I've been using the original for over a year now and I was excited to find out that they'd expanded the Maximum Protection range with products targeting stress and sport related activities. 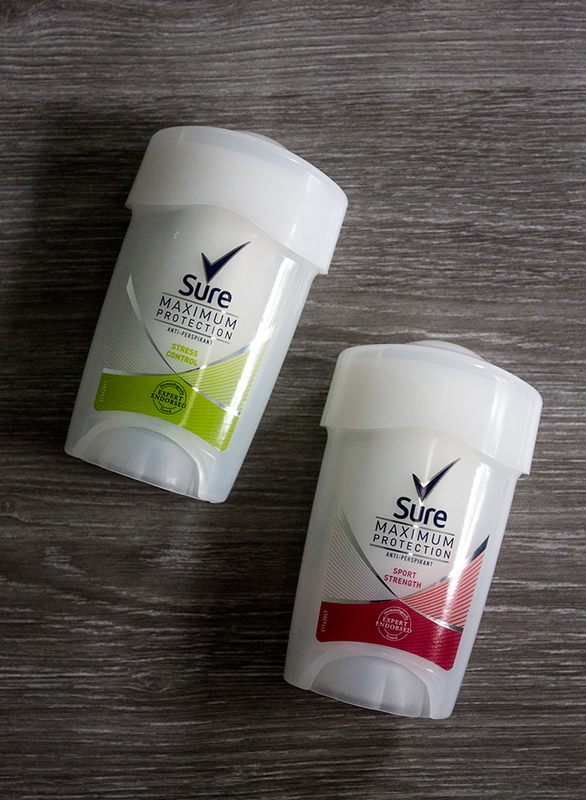 Here's what you should expect from Sure's Maximum Protection: Stress Control & Sport Strength. Starting off with Stress Control, this anti-perspirant is targeted towards people who find they sweat under stressful environments such as work, school etc. I think this one would be suitable for a wide range of people as we all get a bit stressed at times. I've been testing this out at work where I'm constantly running around and I found it worked really well when I've been under pressure. Compared to the original, I found this more effective and it seemed to respond quicker to moments where I might experience more sweating than normal. Scent wise it's different from the original with a sort of citrusy, clean scent to it. Last we have Sport Strength, which if you haven't guessed is for exercise and sport related activities. Now I'm not going to lie, I'm not the most active person so this one doesn't appeal to me as much. But when you see that an anti-perspirant is sport strength then you'd expect it to be the strongest one there is. Overall I found it really effective at controlling sweat but compared to Stress Control, I found it didn't act quite as quickly. Scent wise it's much more like the original, it has a sort of clean cotton scent which I prefer against the Stress Control scent. Overall, I think the Maximum Protection range is wonderful, especially if you find your average anti-perspirant doesn't work for you. If I had to choose out of the two I'd go for Stress Control. Stress seems to be a real trigger for my perspiration so I loved the fact that it can recognise when you need a little extra protection.